The Waste Electrical and Electronic Equipment Regulations (WEEE), EU Directive 2002/96/EC, were adopted into UK law on 2nd January 2007 with full implementation from 1st July 2007. These regulations require that electrical and electronic equipment, when being disposed of at the end of its useful life in an EU Member State, must be recycled and/or disposed of in accordance with the EU directive as it is applied in local laws of that State. These regulations go further by making the manufacturer or importer (the producer) of the goods responsible for their disposal/recycling in the correct manner. Compliance with these new regulations comes at a cost that must, inevitably, be borne by the consumer. Labcold will be, therefore, forced to apply a disposal surcharge to all qualifying orders unless the purchaser is willing to accept the liability for disposal and make alternative arrangements as is specifically proposed in the legislation. Indications from customers are that they are likely to find the constraints of following the varying requirements and timescales of a number of different compliance schemes more costly to administer than to make their own arrangements. This will be particularly the case with refrigerated devices which class as hazardous waste. To this end Labcold will, as standard, issue quotations and pricing excluding any disposal surcharges to prevent customers being overcharged by paying for disposal twice. Customers who do not wish to accept responsibility for disposal must advise Labcold at, or prior to, order placement. Failure to do so will mean that the customer is deemed to have accepted disposal responsibility, however Labcold will still be happy to make the arrangements on a chargeable, not-for-profit basis. Liable products manufactured by Labcold in compliance with UK Statutory Instrument 2006 No. 3289 (the UK law) feature the approved crossed out wheeled bin symbol clearly marked on the serial number plate. Additionally printed information is provided in the instruction manual, or an accompanying slip, outlining the significance of the symbol. Labcold recognises the benefit to the environment of this legislation and is designing products to allow more recycling and less adverse environmental impact. Labcold is registered as a producer with the UK Environment Agency. Where a Labcold product is supplied in a EU member State other than the UK the local importer or distributor will have made the equivalent registration according to local requirements. 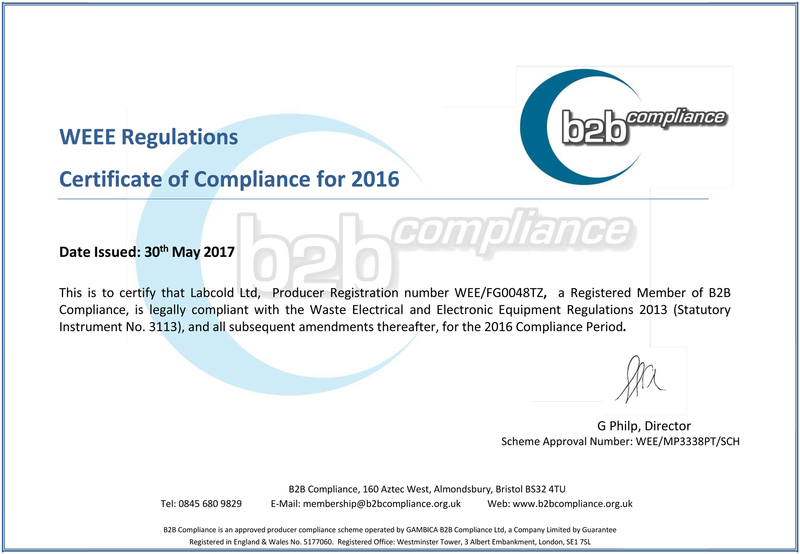 Labcold is a member of the UK’s largest group compliance scheme, B2B Compliance, who are a not-for-profit group scheme specialising in scientific and medical items. B2B Compliance will undertake disposal of Labcold products in the UK on our behalf in accordance with the latest requirements and in the most environmentally efficient manner. Further details of this service can be found in our Procedures document. Customers outside the UK should contact their supplier for further information on the arrangements in place for their own country. The Waste Electrical and Electronic Equipment Regulations (EU 2002/96/EC) are primarily intended to concentrate the minds of manufacturers on recycling materials, and designing products to have lower environmental impact, by making them financially responsible for their disposal at end of life. In order to accelerate the timescale of this process they have also introduced the concept of disposing of the old item that is being replaced, provided it meets a number of qualifying criteria. Please note, in the UK, the law imposes different criteria on disposals from private households resulting in an entirely different set of compliance propositions for such products. Labcold does not manufacture or supply equipment for domestic use. Labcold’s default position is to recognise that most customers will wish to make their own arrangements for disposal, as indicated in our Policy document. Therefore all pricing and quotations issued, unless specifically indicating to the contrary, includes no allowance for costs or charges for WEEE disposal. Where customers wish Labcold to retain WEEE disposal responsibility there will be a chargeable service the cost of which will depend on the size of the item to be disposed of. These costs will not generate a profit for either Labcold or it’s compliance partner, and will be reviewed regularly in the light of experience and improved efficiency. This approach offers an additional benefit by largely negating a requirement in the regulations for the customer to demonstrate the like-for-like nature of the item being disposed of against the new item it replaces. The disposal cost will be dependent upon the size and weight of the item to be disposed of (not the new item being purchased). To establish the cost please contact our sales office either via email at [email protected] , or by telephone on 0870 3001001. Alternatively the price may be shown on a quotation for the new equipment you are purchasing. If you hold an account with Labcold then you may place an order in the normal way (or include it in your order for a new Labcold product), otherwise we accept credit card or cash payment with order. On receipt of your order (and payment where necessary) we will send you a Disposal Voucher featuring a unique reference number confirming your entitlement to the service. Normally you will find this voucher attached to the packaging of your new Labcold purchase in a large “Documents Enclosed” wallet. Your voucher provides details of our nominated disposal agent, called a Compliance Scheme, who can be contacted by telephone or via their website. Details of our nominated Compliance Contractor are given at the bottom of these notes. The Compliance Contractor (B2B Compliance) will handle all aspects of the disposal from this point and can advise on what further steps are needed before collection can be effected. As Labcold products are designed for medical or scientific use, before presenting these or equivalent products for collection and disposal, it will be necessary in all cases for the user to provide documentary evidence of decontamination and/or that the item is entirely safe to handle and dismantle outside of a controlled environment. Goods that cannot be so certified fall outside the scope of the Directive and remain the user’s responsibility for safe disposal. B2B Compliance can provide a suitable decontamination form if required, a copy of which must be supplied to them before collection can be authorised, and a second copy must be attached, in a clearly visible location, to the outside of the item to be disposed of. Most old refrigerators and freezers contain CFC refrigerants which have now been shown to be Ozone Depleting Substances (ODS) and are consequently classed as Hazardous Waste and must be treated accordingly. Where this applies it will normally require the supply of a Hazardous Waste Transfer Note by the collecting contractor to provide an audit trail for the movement of the waste and to prove that your organisation has fulfilled its obligations under the relevant legislation. Where required, only one Hazardous Waste Transfer Note is necessary for each collection and, in order to keep your costs to a minimum, this needs to be organised with, and paid directly to B2B Compliance who can advise what is required. The cost of issuing a Hazardous Waste Transfer Note is not included in any individual unit disposal price offered by Labcold. Finally, once all of the above steps are complete, the item(s) to be disposed of must be moved to a readily accessible ground floor location to await collection which will take place within 30 days of acceptance by B2B Compliance. In order to minimise costs and the adverse environmental effects of excess lorry movements B2B Compliance will consolidate collections within local areas such that vehicles are used to maximum efficiency and we regret that, as a result, prior notice of date or time of collections cannot be provided. The procedure detailed below relates primarily to disposals of qualifying pre-existing items (known as “historic WEEE”) being replaced by a new Labcold product in the UK only. Disposals of new items produced in compliance with EU 2002/96/EC (SI 2006, 3289 in UK Law) are likely to be some years off and will be subject to similar procedures, but with variances, when the time comes.